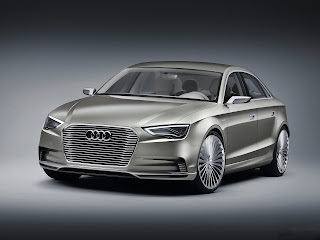 The Audi e-tron family is a series of electric and hybrid concept cars shown by Audi from 2009 onwards. In 2012 Audi produced a plug-in hybrid version, the Audi A3 Sportback e-tron, scheduled for retail sale in Europe for the second quarter of 2014, and in the U.S. in 2015. As this car is still in concept, much of its performance specifications are still uncertain. The car will have four electric motors, one per wheel. Together, these motors will produce 4,500 Nm (3,320 lbft) of torque. Top speed for the e-tron is limited to 200 kilometres per hour (124 mph), and it will be able to travel 150 miles (240 km) on full charge. In concept form, the e-tron also is equipped with conceptual technology: technology that communicates with other cars, road signs, etc. The first e-tron concept car was shown at the 2009 Frankfurt Motor Show. A two-seater, similar in appearance to the Audi R8 but slightly smaller, is powered by four UQM Technologies motors, providing four-wheel drive. Together, these produce 313 PS (230 kW; 309 hp) and 4,500 Nm (3,319.03 lbft) of torque, resulting in an acceleration of 0 to 100 km/h (62 mph) in 4.8 seconds. A 470 kg (1,036 lb) 42.4 kWh lithium-ion battery is located in front of the rear axle and provides a range of approximately 248 km (154 mi) with a full charge taking 6–8 hours from a normal household socket. The ceramic brake discs can also provide regenerative braking energy. In 2010 Audi began a development program with the objective to manufacture a limited production R8 e-tron. The R8 e-tron made a brief appearance in the 2013 Marvel Studios release of Iron Man 3. After developing 10 prototypes for research and development purposes, in May 2013 Audi decided to cancel production of the electric car due to its limited all-electric range as battery technology did not advanced as fast as Audi had expected, making the R8 e-tron unviable for series production. 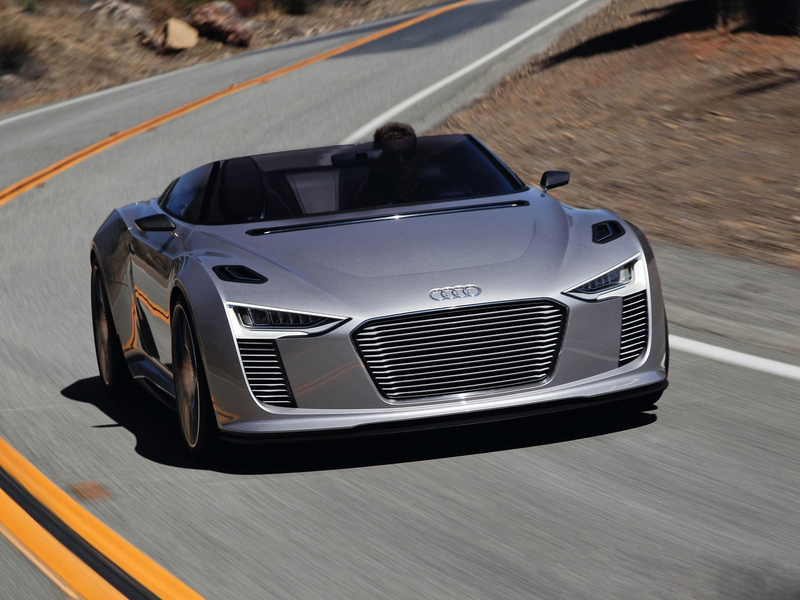 In March 2014 Audi revised its decision and announced it will build the R8 e-tron upon request. The carmaker explained that their latest development work resulted in an increased range from 215 km (134 mi) to approximately 450 km (280 mi). The Detroit showcar Audi e-tron (confusingly, also named "e-tron") includes 2 electric motors driving the rear wheels with a combined output of 204 PS (150 kW; 201 hp) and 2,650 Nm (1,954.54 lbft), lithium-ion batteries behind passenger compartment and ahead of the rear axle, adaptive matrix beam LED headlight modules with clear glass covers, fully automatic light assistance system, Audi Space Frame with doors, lids, sidewalls and roof made of a fiber-reinforced plastic; built-in central display with integrated MMI functions, front axle hydraulic fixed-caliper brake, electrically actuated floating-caliper brakes mounted on the rear axle, heat pump, triangular double wishbones made of forged aluminum components at the front and rear axles, direct rack-and-pinion steering, 19-inch wheels of 35-spoke design, 235/35 front and 255/35 rear tires. The concept car can accelerate from 0 to 100 km/h (0 – 62.14 mph) in 5.9 seconds. The vehicle was unveiled in 2010 North American International Auto Show in Detroit. A similar production model, based on a future mid-engined automotive platform codenamed 9X1, shared with Porsche and Volkswagen, is reportedly under development. 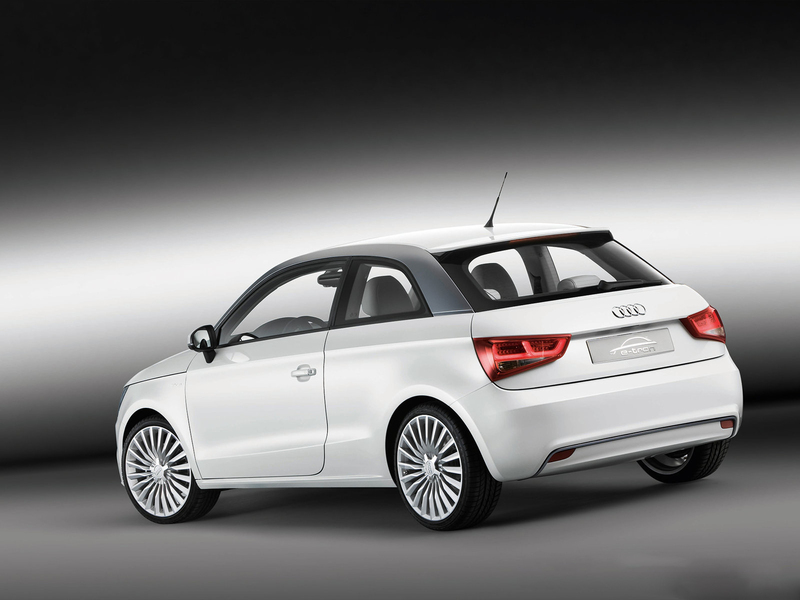 The Audi A1 e-tron concept car, an electric variant of the Audi A1 production model, was first shown at the 2010 Geneva Motor Show. 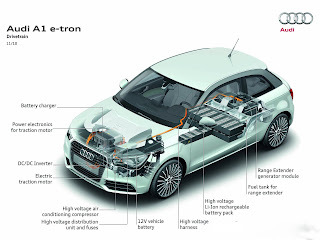 The A1 e-tron is a series plug-in hybrid, powered by an electric motor from UQM with a continuous output of 45 kW (61 PS; 60 bhp), and a peak output of 75 kW (102 PS; 101 bhp). A 254 cc Wankel engine is also used to power a 15 kW (20 PS; 20 bhp) range-extending generator. Shown at the 2010 Paris Motor Show, this roadster is a plug-in hybrid powered by a 221 kW (296 bhp) twin-turbo TDI 3.0 L V6 diesel engine driving the rear wheels, plus two electric motors together producing 64 kW (86 bhp) powering the front wheels. Acceleration to 100 km/h (62 mph) is achieved in 4.4 seconds. Audi presented the e-tron Spyder in January 2011 at the Las Vegas Consumer Electronics Show, near identical to the Paris show car, but this time painted bright red. The car was advertised with the same performance specifications, including an electronically limited top speed of 249 km/h (155 mph). 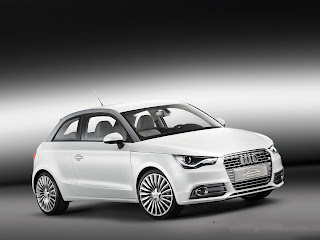 The Audi A3 e-tron is an all-electric car variant of the Audi A3 production model. The A3 e-tron is powered by an electric motor under the hood which sends power from the rear- and mid-mounted battery packs to the front wheels. The 26.5 kWh lithium-ion battery pack provides an optimal range of around 148 km (92 mi), but between 113 to 121 km (70 to 75 mi) in real driving conditions. Top speed is limited to 143 km/h (89 mph). Audi deployed a fleet of 17 all-electric A3 by mid-2012 as part of a testing program in the U.S. The testing is conducted among Audi's engineers and company employees, and the company has no plans to test the vehicles with customers. 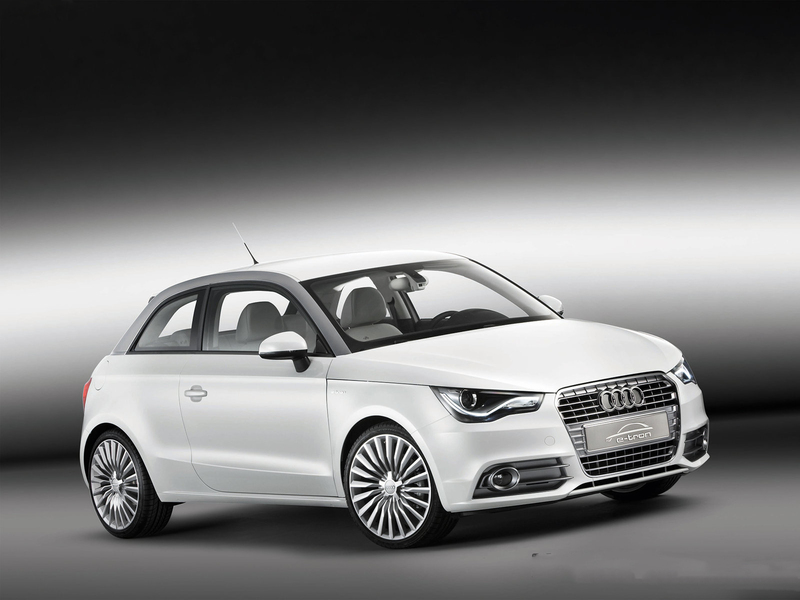 In June 2012 the carmaker confirmed production plans for a plug-in hybrid version of the A3. 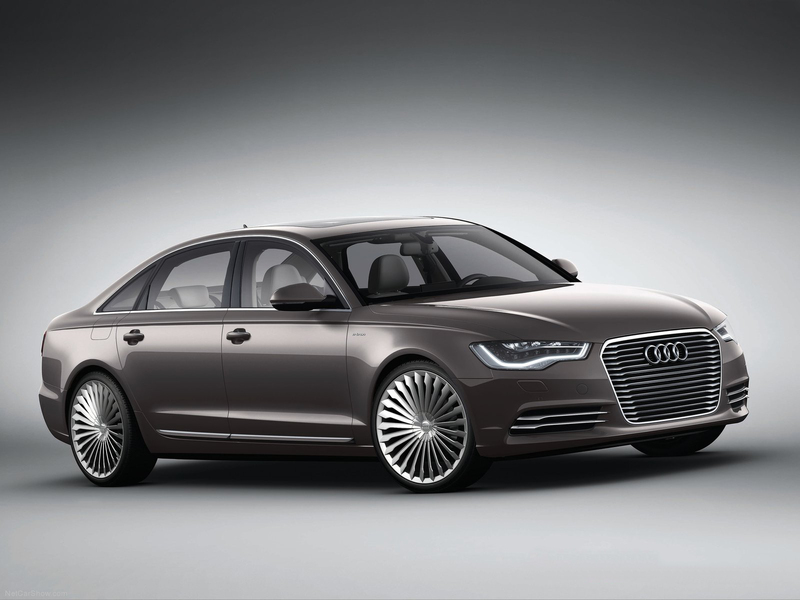 The plug-in hybrid concept car was unveiled at the 2013 Geneva Motor Show. The basic powertrain hardware of the Audi A3 e-tron is shared by the Volkswagen Golf GTE plug-in hybrid, but the software controls of each car are different. 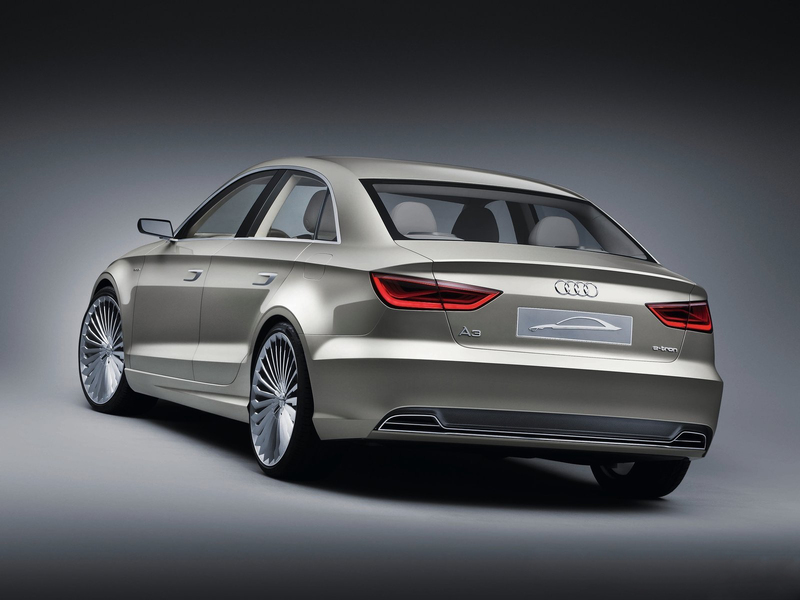 In May 2013 Audi announced its decision to produce only a plug-in hybrid version, the Audi A3 Sportback e-tron. The A3 Sportback e-tron has an 8.8 kWh battery pack that delivers an all-electric range of 50 km (31 mi) on the NEDC cycle, and a total of 940 km (580 mi). The plug-in hybrid can reach a top speed of 220 km/h (140 mph) and can reach 100 km/h (62 mph) in 7.6 seconds. 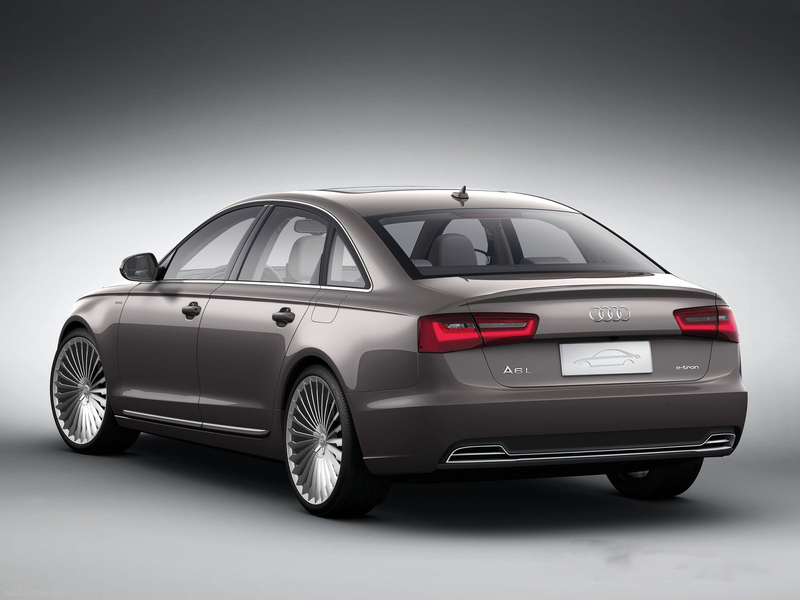 According to Audi the car has an average fuel efficiency of 188 mpg equivalent and CO2 emissions of 35g/km. In September 2013, at the Frankfurt Motor Show, Audi announced that pricing for the Audi A3 Sportback e-tron will start in Germany at 37,000 Euros ($44578.31 USD). Retail sales in Europe are scheduled to begin during the second quarter of 2014 and in the U.S. in early 2015. Last updated on 18 March 2014 at 05:36.